Golaidanga is a small village in Shingair Upazilla of Manikganj District. Since 2006, every year, the locals, with the support from Hakim Ali Gayen, Bunon and Niraboron theatre have been organizing 'Lokonat o Lokogiti Utsab' (folk drama and songs). From a quick look, it may not feel like the most likely place to have a folk festival. On an open field, from the first day of 2013 till the 5th, the festival was not only an arrangement of several plays and songs it also consisted of a fair. The five-day long festival warmed the atmosphere of the cold winter. It consisted of several renowned folk singers and drama troupes. Some of the plays that were presented to the villagers have been performed in various parts of the city, and also in India. The festival brings the villagers closer to their roots – it introduces the younger generation to our very own culture that is in danger of being forgotten because of satellite Tv. And there were always the threat of fundamentalists. The first five days of the English New Year are always extremely cold and dry. Therefore, winter, specially the month of January has always been the perfect month to organize festivals and fairs all over the country. But, the first days of the year 2013, seemed a bit colder than the previous few years. Like a warming party, at a village called Golaidanga in Shingair Upazilla of Manikganj district has been hosting folk drama and dance festival since 2006. Golaidanga is a village which is not too far from the capital, yet not too near. Many of the villagers have at least one of their relatives working in a foreign country. Therefore, for many, entertainment comes in the form of satellite Tv. The root of their culture and is ignored and often unknown to many. Such festivals introduce the younger generation what they are missing. The festival is an initiative by Anan Zaman, assistant professor of Drama and Dramatics at Jahangirnagar University. With the support from various theatre groups and willing locals, the festival is a sigh of relief for the Golaidanga. The village sees very little entertainment throughout the year, let alone a sophisticated one – like the one organized by the enthusiastic young professor. The open wide field near was perfect location for all to gather and enjoy the enthralling performances by renowned artistes of folk culture. The field, near the local Bazar, was center of attention for not only to the villagers of Golaidanga, but also many adjacent villages. The boundary of the festival field was decorated with scarecrows standing guard. The main entrance gate had handicraft hanging on top. It welcomed the guests with a torch and a tower, which was always lit after the sun went down. The intricate design of the boundary was enough to attract many curious minds to have a peek. It was free for all to enjoy – no tickets were sold. 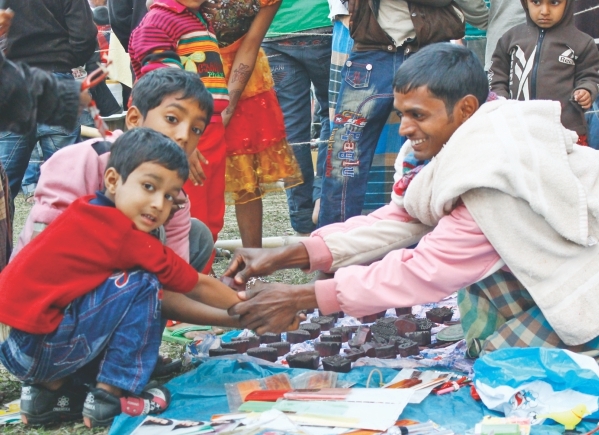 On both sides of the field there were stalls selling jewelry and delicacies. At the end of the field, exactly in the middle stood the stage where the main attraction was. The inauguration day was highlighted by Dhak Badon and Lathi Khela (a performance of Drums and stick-fight), performed by Fakir Chan and his troupe. It was followed by a pala (dance-drama) called Behula Lakhkhinder, performed by Belal Boyati and his troupe. Last act of the evening was a drama Aurangzeb. An intriguing drama based on the life of the Mughal emperor Aurangzeb, the drama in a way was a reflection of the mindset of few fundamentalists who opposed the festival. Unfortunately, the festival was not without troubles. There were a few in the village who tried to dowse the enthusiasm of the festival by creating issues of religiosity. According to Professor Zaman, on its year of inception, there were similar objections. That year, around 200 fundamentalists appeared on the festival ground and tried to put a stop to it. Although nothing so drastic happened this year, but it was surprising that, again some tried to ruin the festival. He also mentioned how a nearby madrassa often discourages its students to attend such event. But that was only for the first day. The rest of the four days went on without any trouble. This was only possible because a very contrast scenario exists in the village. More than half of the villagers who went on to higher studies are studying Drama at various universities. The rest of the four days hosted musical performances from Baul Gaan by Pagli Shilpi, Bichar Gaan Guru Shisher Pala by Jalal Sarker and his troupe, Shongpala by Hakim Ali Gayen theatre and Bicched Gaan by Chaan Mia Boyati. Plays included Selim Al Deen's famous Chaka performed by Bunon theatre, Jatra Pala Laili Mojnu performed by Champa opera and Nishimon Bishorjon performed by Mohakal Natto Shomproday. Some of the plays were directed and written by the organizer Anan Zaman. Nishimon Bishorjon is based on Rabindranath Tagore's "Bisharjan", is a tribute to the poet. The play is a statement against religious extremism in a contemporary setting. Like Auregzeb, Nishimon Bishorjon was a perfect setting for the fundamentalism faced in the Golaidanga. 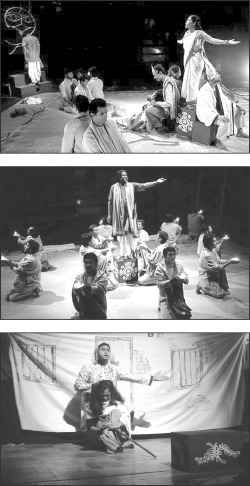 Some plays are regularly performed at Dhaka. Actress Naila Azad Nupur was present in this festival. She has been working as an actor, director, choreographer and costume designer in Los Angeles since 1997. She did her bachelors from Antioch University, Ohio in Theatre and did her Masters from University of California, Los Angeles (UCLA) in Theatre, Film and Television. She has acted in famous Hollywood movies (such as 'Crossing Over'), Television Series (like 'Lie to me', 'CSI' etc) and theatre with A list Hollywood actors. Currently she is acting in Bangladesh and teaching at IUB and ULAB. In an exclusive interview with Star Insight, she shared her experience and views about this festival. Sadia Khalid: How did you come to know about this festival? Naila Azad Nupur: Anan Zaman, the organizer of this festival is a friend of mine. I came to know about the festival from him. I was really excited about seeing Hastor Gaan, Bichchhed Gaan, Shong Pala and other attractions of the festivals, which are our treasured folk heritages. SK: How do you feel about such an initiative? NAN: We really need such initiatives throughout the year. These festivals are essential for the sustainability of our cultural legacy. But unfortunately, there are many obstacles that refrain us from taking such initiatives more often. The fundamentalists tend to obstruct us by arguing that our folk culture does not go hand in hand with our religion, as if it is a platform for them to show off what power they have over the community. I would like to tell these fundamentalists that we are not Arabs, we are Bengalis. We have a different set of culture than them. Following the path of Islam doesn't mean we have to deny our identity as Bengalis. If they feel so strongly against our traditions, they can come out in the open and declare that they are not Bengalis. How the fundamentalists act to hinder such festivals is very impractical and immature. SK: How was the environment of the village? Were the locals appreciative of folk festivals? NAN: The environment was good. The locals were very welcoming. They were very happy to have such a festival arranged for them. For instance, when Behula was performed, they sat there eagerly. As they already know these folk stories, they were very happy to have these stories performed just for their entertainment. When 'Aurangzeb' was performed, they were so silent that the performers did not need a microphone to perform in front of hundreds of audience. When the generator failed for a brief moment, the audience aimed the torches in their hands at the stage, so that the show could continue seamlessly. This is how much the locals really appreciate these festivals. SK: What do you feel was the outcome of this festival? NAN: Such initiatives help us get our cultural heritage across to the remote villages. These locals do not have a regular source of entertainment that showcases our folk treasures as well. So these festivals not only provide entertainment, but also help to make people more culturally aware. SK: Can you share some final thoughts that can help such initiatives in the future more successful? NAN: We need strong and influential people to organize such festivals. These need to be more organized. We need to include the locals in the decision making process, so that they don't feel left out. Instead, then they will feel like they are a part of it and not just the audience of some spectacle. It will also help the organizers to understand and meet the expectations of the target audience.